Definition at line 21 of file Disk.h. Definition at line 24 of file Disk.cc. Definition at line 33 of file Disk.cc. References disker, IamWorkerProcess(), and KidIdentifier. Referenced by Rock::SwapDir::allowOptionReconfigure(), and optionObjectSizeParse(). Implemented in Rock::SwapDir, Fs::Ufs::UFSSwapDir, and TestSwapDir. Definition at line 164 of file Disk.cc. References Store::Storage::currentSize(), debugs, EBIT_TEST, ENTRY_SPECIAL, flags, StoreEntry::flags, HERE(), index, max_objsize, maxSize(), objectSizeIsAcceptable(), and Store::Disk::Flags::read_only. Referenced by Fs::Ufs::UFSSwapDir::canStore(), and storeDirSelectSwapDirLeastLoad(). Reimplemented in Rock::SwapDir, and Fs::Ufs::UFSSwapDir. Definition at line 40 of file Disk.cc. Implemented in Fs::Ufs::UFSSwapDir, Transients, TestStore, MemStore, Rock::SwapDir, Store::Controller, Store::Disks, and TestSwapDir. Referenced by Store::Disks::currentCount(), getStats(), and Store::Storage::~Storage(). Referenced by canStore(), Store::Disks::currentSize(), diskFull(), getStats(), storeDirSelectSwapDirLeastLoad(), and Store::Storage::~Storage(). Definition at line 139 of file Disk.cc. Referenced by Store::Disks::dereference(), and maxSize(). References dumpOptions(), finalizeSwapoutFailure(), finalizeSwapoutSuccess(), getOptionTree(), hasReadableEntry(), parseOptions(), and reconfiguring. References Store::Storage::currentSize(), DBG_IMPORTANT, debugs, index, max_size, and maxSize(). Referenced by disconnect(), and Fs::Ufs::UFSSwapDir::dump(). 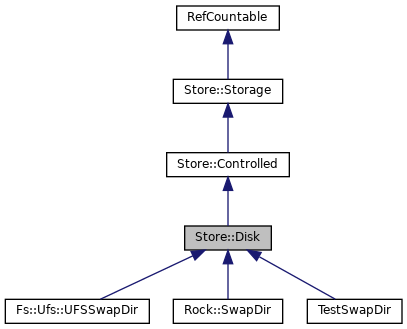 Implemented in Transients, MemStore, Fs::Ufs::UFSSwapDir, Rock::SwapDir, Store::Disks, Store::Controller, and TestSwapDir. Referenced by Store::Disks::evictCached(), and Store::Storage::~Storage(). Referenced by Store::Disks::evictIfFound(), and Store::Storage::~Storage(). Implemented in Fs::Ufs::UFSSwapDir, Rock::SwapDir, and TestSwapDir. Referenced by disconnect(), and storeSwapOutFileClosed(). Definition at line 258 of file Disk.cc. References optionObjectSizeDump(), optionObjectSizeParse(), optionReadOnlyDump(), optionReadOnlyParse(), and ConfigOptionVector::options. Referenced by disconnect(), dumpOptions(), Fs::Ufs::UFSSwapDir::getOptionTree(), Rock::SwapDir::getOptionTree(), and parseOptions(). References StoreInfoStats::Part::capacity, StoreInfoStats::Part::count, Store::Storage::currentCount(), Store::Storage::currentSize(), doReportStat(), maxSize(), StoreInfoStats::Part::size, and StoreInfoStats::swap. Referenced by Store::Disks::getStats(), and maxSize(). Implemented in Rock::SwapDir, Transients, TestStore, MemStore, Fs::Ufs::UFSSwapDir, Store::Controller, TestSwapDir, and Store::Disks. Referenced by Store::Disks::init(), and Store::Storage::~Storage(). Definition at line 86 of file Disk.cc. Referenced by Store::Disks::maintain(), and maxSize(). References Config, max_objsize, SquidConfig::maxObjectSize, maxSize(), min(), and SquidConfig::Store. Referenced by maxSize(), objectSizeIsAcceptable(), storeDirSelectSwapDirLeastLoad(), Rock::SwapDir::validateOptions(), and Fs::Ufs::UFSStoreState::write(). References DBG_PARSE_NOTE, debugs, max_objsize, maxSize(), and path. References dereference(), getStats(), maintain(), max_size, maxObjectSize(), minObjectSize(), minSize(), objectSizeIsAcceptable(), reference(), smpAware(), stat(), and Ping::stats. Referenced by canStore(), Rock::SwapDir::create(), Rock::SwapDir::currentSize(), diskFull(), Fs::Ufs::UFSSwapDir::dump(), getStats(), Rock::SwapDir::ioCompletedNotification(), Fs::Ufs::UFSSwapDir::maintain(), maxObjectSize(), Store::Disks::maxSize(), minSize(), Rock::SwapDir::slotLimitActual(), Fs::Ufs::UFSSwapDir::statfs(), Rock::SwapDir::statfs(), storeDirSelectSwapDirLeastLoad(), and Rock::SwapDir::validateOptions(). References Config, min_objsize, SquidConfig::minObjectSize, and SquidConfig::Store. Referenced by maxSize(), and objectSizeIsAcceptable(). References Config, SquidConfig::lowWaterMark, maxSize(), and SquidConfig::Swap. Referenced by Fs::Ufs::UFSSwapDir::maintain(), maxSize(), and Store::Disks::minSize(). References assert, maxObjectSize(), and minObjectSize(). Referenced by canStore(), and maxSize(). Definition at line 382 of file Disk.cc. References max_objsize, min_objsize, PRId64, and storeAppendPrintf(). 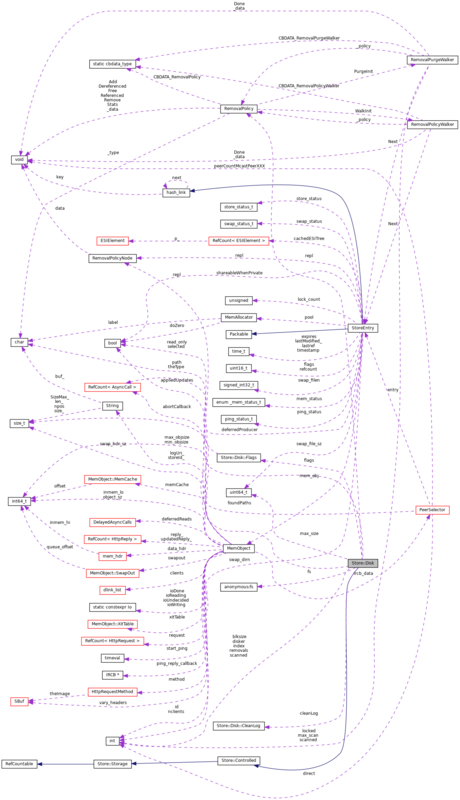 Referenced by getOptionTree(), and sizeInBlocks(). Definition at line 347 of file Disk.cc. References allowOptionReconfigure(), DBG_IMPORTANT, debugs, max_objsize, min_objsize, NULL, path, self_destruct(), size, and strtoll(). Definition at line 340 of file Disk.cc. References flags, Store::Disk::Flags::read_only, and storeAppendPrintf(). Definition at line 318 of file Disk.cc. References DBG_PARSE_NOTE, debugs, flags, Store::Disk::Flags::read_only, and xatoi(). References DBG_IMPORTANT, debugs, flags, getOptionTree(), ConfigParser::NextToken(), NULL, ConfigOption::parse(), path, Store::Disk::Flags::read_only, and self_destruct(). Referenced by disconnect(), Rock::SwapDir::parse(), and Rock::SwapDir::reconfigure(). Definition at line 136 of file Disk.cc. Referenced by maxSize(), and Store::Disks::reference(). References fs, optionObjectSizeDump(), optionObjectSizeParse(), optionReadOnlyDump(), and optionReadOnlyParse(). References RemovalPolicy::_type, doReportStat(), fs, index, path, repl, statfs(), RemovalPolicy::Stats, storeAppendPrintf(), and type(). Referenced by Rock::SwapDir::create(), Fs::Ufs::UFSSwapDir::createDirectory(), Fs::Ufs::UFSSwapDir::doubleCheck(), maxSize(), Fs::Ufs::UFSSwapDir::openTmpSwapLog(), Fs::Ufs::UFSSwapDir::pathIsDirectory(), Store::Disks::stat(), and Fs::Ufs::UFSSwapDir::writeCleanStart(). Definition at line 83 of file Disk.cc. Referenced by dump_cachedir(), parse_cachedir(), and stat(). Referenced by active(), and configDoConfigure(). Referenced by canStore(), optionReadOnlyDump(), optionReadOnlyParse(), parseOptions(), Fs::Ufs::UFSSwapDir::statfs(), Rock::SwapDir::statfs(), and storeDirSelectSwapDirLeastLoad(). Referenced by Fs::Ufs::UFSSwapDir::addDiskRestore(), Disk(), Fs::Ufs::UFSSwapDir::evictCached(), Fs::Ufs::UFSSwapDir::finalizeSwapoutSuccess(), sizeInBlocks(), and stat(). Referenced by Fs::Ufs::UFSSwapDir::addDiskRestore(), Rock::SwapDir::anchorEntry(), canStore(), Fs::Ufs::UFSSwapDir::closeLog(), Fs::Ufs::UFSSwapDir::closeTmpSwapLog(), Rock::SwapDir::createStoreIO(), Rock::SwapDir::createUpdateIO(), Rock::SwapDir::disconnect(), diskFull(), Rock::SwapDir::evictCached(), Rock::Rebuild::failure(), Rock::Rebuild::freeBadEntry(), Rock::Rebuild::freeSlot(), Rock::SwapDir::ioCompletedNotification(), Rock::Rebuild::loadingSteps(), Rock::Rebuild::loadOneSlot(), Fs::Ufs::UFSSwapDir::logFile(), Rock::SwapDir::noteFreeMapSlice(), Fs::Ufs::UFSSwapDir::openLog(), Rock::SwapDir::openStoreIO(), Fs::Ufs::UFSSwapDir::openTmpSwapLog(), Rock::SwapDir::parse(), Fs::Ufs::UFSSwapDir::replacementAdd(), Fs::Ufs::UFSSwapDir::replacementRemove(), Rock::Rebuild::start(), stat(), storeDirWriteCleanLogs(), Rock::Rebuild::swanSong(), Fs::Ufs::UFSStoreState::UFSStoreState(), Rock::SwapDir::updateAnchored(), and Rock::Rebuild::validationSteps(). Referenced by canStore(), maxObjectSize(), optionObjectSizeDump(), and optionObjectSizeParse(). Referenced by diskFull(), maxSize(), and Rock::SwapDir::parseSize(). Referenced by minObjectSize(), optionObjectSizeDump(), and optionObjectSizeParse(). Referenced by Rock::SwapDir::create(), Fs::Ufs::UFSSwapDir::createSwapSubDirs(), Fs::Ufs::UFSSwapDir::DirClean(), dump_cachedir(), Rock::SwapDir::freeSlotsPath(), Fs::Ufs::UFSSwapDir::fullPath(), Rock::SwapDir::inodeMapPath(), Fs::Ufs::UFSSwapDir::logFile(), Fs::Ufs::UFSSwapDir::maintain(), maxObjectSize(), optionObjectSizeParse(), Rock::SwapDir::parse(), parse_cachedir(), parseOptions(), Rock::SwapDir::parseRateOption(), Rock::SwapDir::parseSize(), Rock::SwapDir::parseSizeOption(), Rock::SwapDir::parseTimeOption(), stat(), Fs::Ufs::UFSSwapDir::statfs(), Fs::Ufs::UFSSwapDir::swapSubDir(), Rock::SwapDir::validateOptions(), Fs::Ufs::UFSSwapDir::verifyCacheDirs(), and ~Disk(). Referenced by Fs::Ufs::UFSSwapDir::dereference(), Rock::SwapDir::dereference(), Rock::SwapDir::ignoreReferences(), Fs::Ufs::UFSSwapDir::maintain(), Rock::SwapDir::parse(), Fs::Ufs::UFSSwapDir::reference(), Rock::SwapDir::reference(), Fs::Ufs::UFSSwapDir::replacementAdd(), Fs::Ufs::UFSSwapDir::replacementRemove(), stat(), Rock::SwapDir::trackReferences(), and Fs::Ufs::UFSSwapDir::writeCleanStart(). Definition at line 94 of file Disk.h.